It all started with a shopping trip to Sur La Table, some 5 years ago. As we entered my sister Jeanette, at age 88 and me at 75, spotted a large bowl containing Halloween spider hats, and she wanted one. I asked her why in the world, and she said she did not know. We had never been into Halloween costuming before, so I decided to give it a go. My first thought was Charlotte of Charlotte's Web, but finally decided super heroes are hot, instead. Only one spider came to mind, and that was Spider-Man, who is a man. I went online to learn more about our hero, thinking my sister could portray his mother. The absolute fact is that she is dead, and as a child was raised by an aunt (not ant) instead. I continued to read then suddenly knew, his mothers were/are actually two. His second, of course is that “radiant” spider who created the hero. It was HER bite that made Peter Parker half spider, half man. and as with Mark Twain her death had been greatly exaggerated. 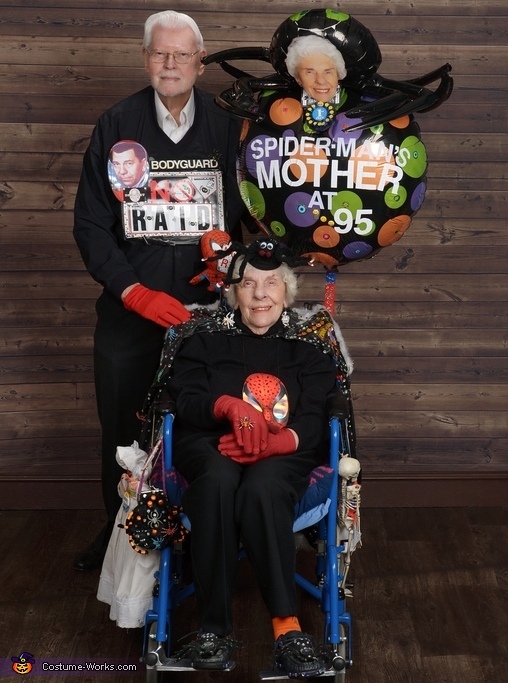 At age 95 Spider-Man's Mother lives on. Her sole mission in life, yes one, is to protect Spider-Man from that lethal product. So far he's left all his enemies so “daid”, but there's still one out here, and that one is RAID! Thinking she needed protection as well, she decided a bodyguard would be just swell. Dragnet's “Web” had just retired, and so he that was the one she hired. Are you too young to know of Jack Web? You may have to ask your granddad instead. Spider-Man's niece wanted to go along for the ride, so it's Spider-Man's Mother, her bodyguard Web, and his niece SPIDEY GAGA, who are “knocking them dead”. She's wear black slacks and a black top, and her red gloves have spider rings on top. She sports orange spider socks in regular SAS shoes, with glittery spiders glued on top, with the help of some glue. Added to her spiderey hat are fingernails, eyelashes and its mouth. Hanging around mom's neck is a Spider-Man face, always on guard around, once the face of a child's greeting card. The reverse side of Toby McGuire, who played Peter Parker, as though he was on fire. Her once black spider earrings, are now painted white. Her outer cape is a black plastic table cloth, lined with another, all Spider-Man, bright. The capes, both in and out, are covered with spiders, with Spider-Man decals and hundreds of gemstones. The back of her cape is webbing white, and right in the middle you see her web site. Jack's wearing black slacks, white shirt and black shoes. On the front of his black nylon top is a hand-crafted sign, NO RAID. Glued to the bottom of the sign is a Spider-Man doll, holding another NO RAID, next to an image of RAID. On the back of Jack Web's black top is his spider web, cut from plastic table cloth. It too is “blinged” with adhesive gemstones, showing it's capture of three cans of Raid, And as a gesture to the “lady” he serves, he wears red gloves, with the same kind of nerve. On one side stands Spidey Gaga, Spider-Man's niece. She can cast a curse on anyone trying to steal Mother's spidery purse. On the other side of her bodyguard powered chair is the human face of Spider-Man's Mother, touting yet another NO RAID, right next to skeleton, a victim of RAID. And next to the skeleton for all to see, hangs a CAN of RAID, with the letters, RIP. In 2012 it was just the hat, and every year after, much more than that. At Calabasas Sagebrush Cantina, we won five hundred dollars, as first place. At Moorpark's Marketplace we came in second, for another five hundred bucks that we spent in seconds. In Ojai we won their first place medal for being their Best Mardi Gras Couple. At Goleta's Bacara Resort and Spa, we won two free nights there, and are still in awe. From the Ventura Harbor Comedy Club, we won first place, a whale watching cruise that was so much fun. Just down the street from where we live, it was dining free Brendan's Irish Pub. We wrote SC Johnson, the makers of Raid. They applauded Spider-Man's pluck,and wished him good luck. Then one day arriving home, we saw a large box from a Fed-Ex truck. It SC Johnson the label said, filled to the brim with a lot of their products, one grim. We knew right away that in their own way, they were assuaging HIM. This is an amazing, well thought out costume! They definitely seem to qualify for a prize!! !